Chicagoland's Top Rated Children's Magician! "Dan Mindo Wows the Crowd"! – The Daily Herald! As a Chicago Magician, I eat lots of pizza… I mean I entertain at lots of Birthday Parties where I eat lots of pizza…Okay I will stop with the pizza! 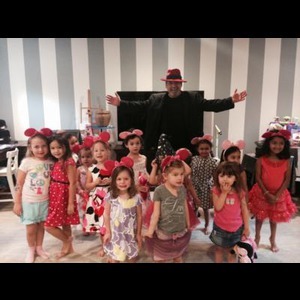 When you hire an entertainer for a kid's party in Chicagoland, whether it be a Birthday Party or another children's event why not hire one that specializes in parties for children. Kids want to be amazed, laugh, interact with the magician and most importantly have fun. 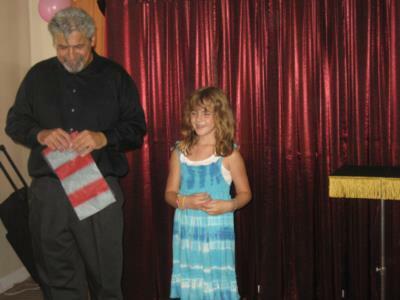 As the father of a little girl, I understand how to entertain children with the experience of a live magic show! The show features comedy, magic, mystery and surprise. The birthday child is featured in the fun that is designed to make them feel like a star and leaves them with a magical gift that they helped to create! The show also features lots of audience involvement so that even the children that are not called up to assist are still involved in the show and their involvement is key to the show's success! While my show is family friendly, my focus is to amaze and entertain the kids. Sure, moms and dads and adult guests will enjoy the show but my goal is to make the children laugh and leave them with a sense of wonder and mystery! When I perform at a birthday party my goal is all of the above but more importantly it is to make the birthday child feel special, make that child feel like he or she is magical. After all, this is their special day! I do that by letting them create some of the magic in the show. Create, even if for just a few moments, an experience that is limited only by their imagination! A day they will remember long after the presents they've received have been forgotten. Why just have a party when you can create a wonderful childhood memory? I promise to do everything I can to make your child's party a fun-filled memorable experience! If you are planning a child's birthday party or would like to entertain your adult guests with magic that delights and mystifies, please contact Dan Mindo. Chicago & DuPage, and Kane County are all within my travel radius. "Everyone had a great time. And apparently all the kids were talking about magic on their way home. Graham loved being part of the show. You are very pleasant and easy to work with. Thank you." "Thank you for being so entertaining, so funny, they loved it! I've run into a few of the girls since then and they let me know how much fun your show was. And Claire had a simply splendid time! Thanks for being so easy to work with – I will definitely recommend you to friends!" "Dan Mindo did a wonderful job entertaining the children at our charity event! He twisted balloons into all kinds of fantastic animals and shapes, keeping the kids happy and engaged. Kids of all ages loved his magic! We will be very happy to have Dan return next year to captivate all the kids at our event. Thank you Dan, look forward to seeing you again!" "Thanks so much, the kids really enjoyed the show and balloons! You have a great way with the kids." "Best decision I ever made regarding my daughter's birthday celebration. Mr, Mindo was able to tame and dazzle a crowd of 8 year old children. My daughter said it was her best party ever. She was beaming while assisting a particular act. All the children were excited to receive balloons that Mr. Mindo twisted into various animals or objects. Overall the show exceeded my expectations." 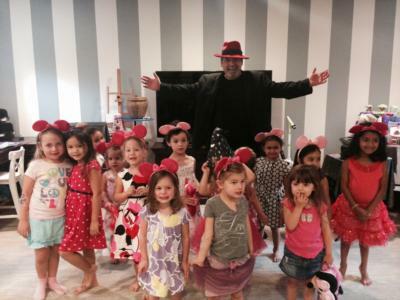 "My daughter Ava wanted to have a magician at her 8th birthday party. We were fortunate enough to find Dan Mindo. Dan Mindo was able to captivate 30 children with his mystifying magic act. All the children were completely spellbound. They thoroughly enjoyed being called up on stage and assisting with the magic show. After the magic show Dan made balloon creations for all of the kids. I don't know how it could have been any better! It was the best and most fun party we have ever had. I'm not sure how I'd ever top Dan Mindo!" "Dan Mindo recently performed his magic show for my son and we were both blown away by his rapid fire magic! His interaction with the children made them feel as if they were the stars of the show. His ability to entertain and interact with the kids without embarrassing them made for a wonderful day of magic! We will definitely be booking Dan again next year." "Dan did a fantastic job! I had never seen a magic show live before, and I was very impressed with the tricks he did; he also included EVERYONE in the fun and magic. I would definitely have Dan perform at another party. Great job Dan, everyone loved your act!" Dan Mindo was terrific! He arrived early, set up, and immediately connected with the kids. He had them laughing before the show began and my daughter said it was her favorite birthday party ever! Thanks again! Please note Children's Party Magician - Dan Mindo will also travel to Elmhurst, Lombard, Oak Brook, Addison, Berkeley, Carol Stream, Hillside, Glen Ellyn, Hinsdale, Westchester, Bellwood, Bensenville, Downers Grove, North Lake, Stone Park, Westmont, Chicago, Clarendon Hills, Franklin Park, Glendale Heights, La Grange Park, Maywood, Melrose Park, Western Springs, Wheaton, Wood Dale, Bloomingdale, Brookfield, Hines, Itasca.